Jake and I joined a gliding club in October in our area. We were both set on getting our glider add-ons for a cheaper fun thing to do together. It’s also a way to build up my flight time for my commercial in a less expensive way. Due to my work schedule and weather, we’ve got extremely unlucky and haven’t flown since then. Sunday I got to make it out there! I work until 4am, so I didn’t get out there until about 3pm. I wanted to wake up earlier, but that snooze button was too tempting. We’ve been getting pushed by the club to be more active and be part of a crew, so finally I felt like I wasn’t slacking. I find it interesting how in the club it’s different for people without set schedules or odd schedules, since I figured many pilots and other aviation people would be involved. They have been understanding though and working with our odd schedules. They had me jump right into learning crew duties. I learned to how to make a rope adapter to attach the glider to the tow plane. We have 2 types of hook ups one for the European gliders and another for the American made ones so I learned about both and making the rope strong enough to handle towing the gliders. Next up was launching the gliders. I learned all the hand signals and how to prep the glider correctly and be the wing runner when the glider was launching. I actually really enjoyed that part! It’s fun to run along with the glider, but you find out how quickly it picks up speed! I can only get about 10-15 feet before it’s too fast to keep up. After, I finally got to go up for a lesson. We found an available instructor and we had some ground time before going up. 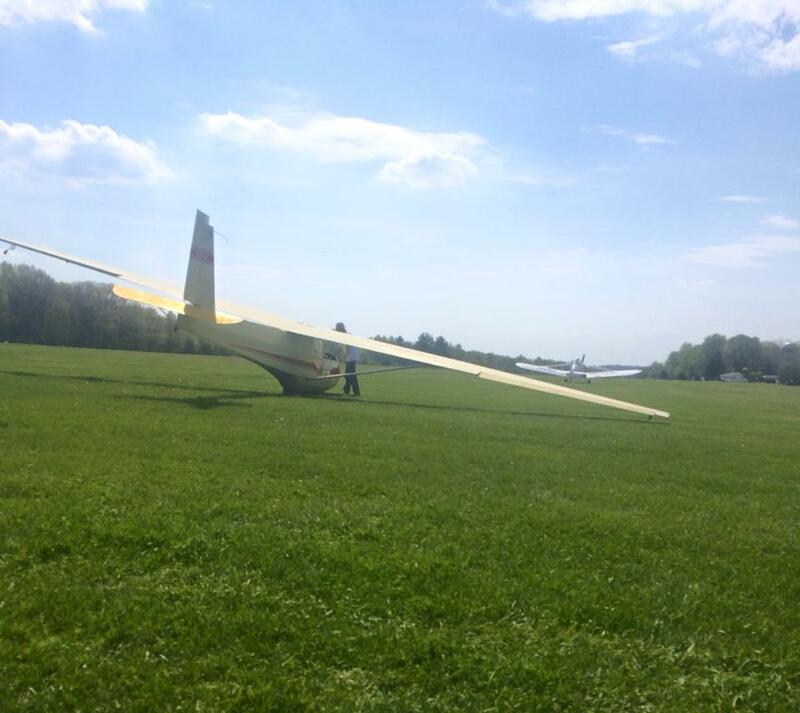 I had been up once in October and two rides with other glider pilots for fun. While I enjoyed the instructor really going over items on the ground since I find I don’t absorb things as well in the moment in the air, it was a bit slow for my learning taste. Again, I did appreciate it though so it made learning up in the air quite easy. My October lesson was a bit all over the place. It wasn’t bad, but following the tow plane was difficult and the pattern wasn’t pretty. I think due to being current now in powered aircraft and my tailwheel time, things became much easier. I followed the tow plane a bit after the launch and didn’t over control the glider which I did before. I remember from my initial lessons in the 152 that I have that tendency. I kept the rope taut, unlike the first time I kept getting slack line. Up in the air, we did some turns but couldn’t find any thermals so it ended quickly. He said my control was good and coordination was good too. Again, I know my first lesson I wasn’t using enough rudder since you don’t really need much in a Cessna. Now flying the Cub and doing aerobatics, I’m not timid on the rudder. Pattern was almost perfect, but I did flare slightly too high at first. It’s a bit scary knowing you have one chance to land! I went up one more time that day. Again a short time, but I mainly worked on following the tow plane and the pattern. I noticed it got hazy out so it was a bit harder to keep the tow plane on the horizon when the horizon wasn’t too clear. Second time coming in I was a bit high and we did a slip, but again piece of cake since I slip all the time now. Slipping in the glider is a bit different though, lots of rudder and little aileron. If you put in too much aileron you start to lose control of the glider. I can’t wait to get this rating! I just have to force myself to get up earlier on Sundays after work. Hopefully there will be more to share next week. Sounds fun. been trying to find time to add a glider rating myself… Thanks for the motivation! Good luck on your PPL! Gliding and aerobatics have made me a better pilot and understand topics that made me a bit unease during my PPL.